As an income investor, I have to not fall in love with a stock. Yet, I am a seasoned investor and I like to work even those stocks that I have owned a long time. Even stocks that I have loved like Intel, symbol INTC. One technique often discussed among income investors who have built large positions over time is to take your cost basis off the table. Sell enough shares to pocket your original investment. Clearly you need a stock that has price appreciation over time to make this work. I need 5% income from my portfolio. Intel is paying 2.49% dividend yield. I could make up the difference between the yield of 2.49% and my 5% income requirement by selling calls. But, then you risk losing your position unless you are a very savvy call seller. INTC delivers strong dividend growth. Their most recent increase was 10.09%. However, October of 2011 through November of 2014 the dividend growth was only 2.4% annually. 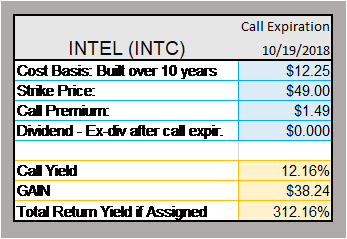 If we go through rough times again, I have every confidence that INTC will continue to deliver the 2.49% dividend but I also know the calls will dry up and so will the dividend increases. I will be stuck with only half of the income I need from this investment. Put all this together and I think it is times to make a change. I am selling a call on enough shares that if they are called away, I get back my cost basis. You will see in the table below the return on this trade. I fully expect the calls to be exercised because I picked a strike price just $1.00 away from where it is trading to day. Moreover, I selected an expiration date that is only 18 days away. When they do take these shares, I will move them into a 4 or 5% yielding stock that also delivers dividend increases. I am not looking for a stock that delivers both high yield and calls. For the money I get from selling INTC, I want only to double the income I getting right now. My strategy also includes keeping the rest of my shares of INTC. I have already pocketed my original investment. If INTC gets their act together and can meet the demand for chips for PC's, then I fully expect to reap the benefits of these remaining shares through dividend increases and possible call income. INTC can be considered a boring stock that just cranks out a dividend but faces growth challenges. Stocks like this can be a drag on your income. Unless they are raising the dividend well above inflation, one gets the itch to move at least some of it into a higher income instrument.